It can be very easy to hop into the shower and lose all track of time. As relaxing as a shower is, it also contributes significantly to both water and water heating costs. Being aware of how much time is being spent in the shower just may motivate you to spend less time in there. 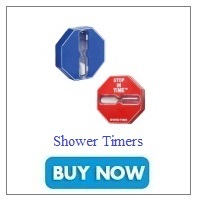 Choosing a shower timer can help you do just this, ultimately reducing utility bills as well. A five-minute sand shower timer is both water-proof (that would be a good thing) and simple to install. The suction cup should be placed on the shower wall, and that’s it. At the beginning of your shower, rotate the timer so that the sand begins to flow downward. Once the sand has stopped, you know that five minutes have passed. With every rotation, you know that another five minutes have passed. This next timer measures five-minute intervals as well, but is a bit more technical than the first. It can be installed using either an adhesive backing or with the suction cup that it comes with to the wall of the shower. When your shower starts, press the bottom of the shower timer, lighting up a blue LED. At the four-and-a-half minute mark, the color of the LED will change to red. The red LED light flashes for 30 seconds, acting as a reminder of how much time has passed. A digital shower timer allows you to set a target shower time, and the measuring bag included provides knowledge of how much water is being used. The recommended time for usage is 9.25 gallons of water, the equivalent of four minutes. It can hang onto the showerhead with a lanyard, or installed with, you guessed it, a suction cup. Turn the digital timer on at the start of each shower and watch the progress on the screen. Once the target water volume has been reached, an alarm will sound. In the average home, shower water usage accounts for 17 percent of residential indoor water costs, 66 percent of all hot water expenses. Installing any of these timers will help set you on the right track to saving not only water, but the amount of money spent on both water and water heating.